It takes some guts to rewrite what is possibly the most revered play of all time: Hamlet. Even when Tom Stoppard played around with Shakespeare’s masterpiece in Rosencrantz and Guildenstern Are Dead, he didn’t mess with the original dialogue, but built around it. In Hamlet. A Version (directed by Irina Gachechiladze), Boris Akunin has no such reservations. Akunin, widely known in Russia for his works of detective fiction, doesn’t entirely discard Shakespeare’s original, retaining a line or two here and there, and keeping mainly to the original plot – but nor does he stubbornly follow the text. Akunin reworks Hamlet to such a degree that it becomes a new story, with new dialogue, new characterizations, and new takeaways. You might expect a rewrite of Hamlet to be disappointing, totally pointless, and not worth your time. And, prior to seeing Akunin’s Hamlet. A Version, I probably would have agreed with you. But we would both be wrong. Akunin’s script is dazzling, and his new (or should we say alternate?) Hamlet is a breathtaking journey: full of wit, humor, tragedy, and twists. If you go in expecting to see a purist staging of Shakespeare’s Hamlet, you might be disappointed. But if you put what you think you know on hold and let Akunin’s reimagining sweep you up in its magic, you’ll have the ride of your life. 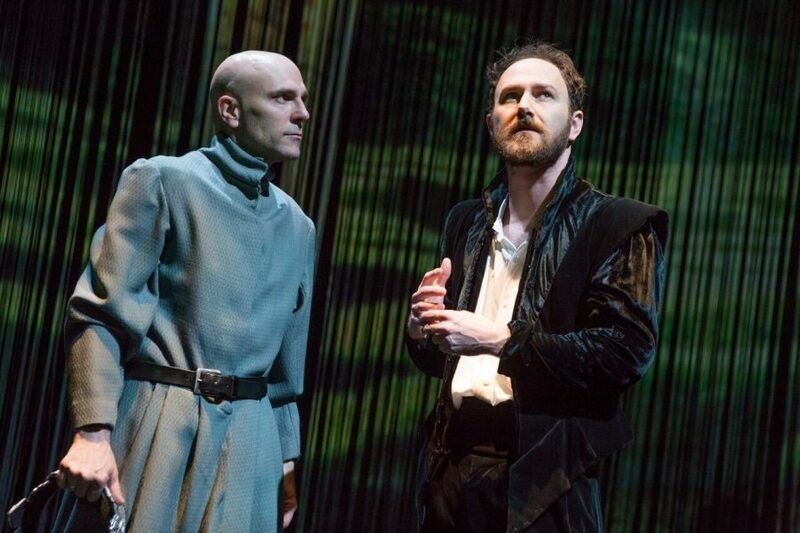 Aided by digital projection, lighting, and wonderful Elizabethan costumes, Hamlet. A Version moves along smoothly from start to finish. The atmospheric setting (The Theatre at St. Clement’s) and Giya Kancheli’s imaginative score further contribute to the play’s sense of enchantment. In the role of Prince Hamlet, Matt Weiss exceeds expectations. Anyone presupposing a brooding, self-reflective Hamlet in the vein of Kenneth Branagh is going to get a rude awakening. Weiss’s Hamlet is boisterous, incompetent, and frequently drunk. Despite all of that, however, he manages to be compelling. The other stand-out actor is Michael Propster, who plays Guildenstern (and later Osric) with brilliant hilarity. Joy Hermalyn also gives a moving performance as Queen Gertrude, and Khris Lewin plays Horatio perfectly. My only beef with the production was Ophelia’s characterization, which felt somewhat lacking. Her mad scene is nowhere near as chilling as Shakespeare’s original, but maybe it’s more relevant to Akunin’s reworking, in which Ophelia is less of a focal point anyway. In our modern, post-death-of-the-author age, perhaps we can expect to see more plays like Hamlet. A Version: at least, I certainly hope so. At any rate, the authentic, four-hour Hamlet has been – and will continue to be – performed often enough. When Akunin’s Danish prince exclaims: “To be or not to be? Who cares!” he may in fact be voicing the opinions of millions of viewers of Hamlet throughout the ages. Obviously, I’m not suggesting we throw Shakespeare’s Hamlet out the window. But every now and then, we need something like Hamlet. A Version to shake things up and give us a new perspective. Akunin’s play does that perfectly. And I think even Shakespeare would approve.